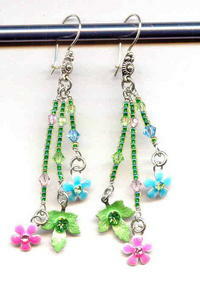 They dangle from wires on which are threaded deep green seed beads and co-ordinating Swarovski crystal beads. The longest dangle ends about 3" below the top of its ornate sterling silver European finding. Fresh and lightweight, they're another pair of grand summer earrings from SPARKLE PLENTY. These long elegant dangle earrings feature deep blue lapis lazuli 6mm, sunny peach aventurine 8mm, and tranquil aqua quartz 10mm beads.